Film Independent, the non-profit arts organization that produces the Film Independent Spirit Awards and Los Angeles Film Festival, announced that David O. Russell’s Toronto International Film Festival winner of the “People’s Choice Award” SILVER LININGS PLAYBOOK will kick off the 8th annual Film Independent Forum as the opening-night film on Friday, October 19. The screening of the film will be followed by a discussion with producer Jonathan Gordon and editor Jay Cassidy (additional panelists TBD). 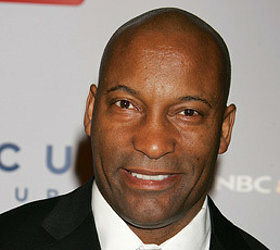 On Saturday, October 20 Academy Award® nominated director John Singleton, will serve as the keynote speaker. The annual forum for independent filmmakers, which is headed by Film Independent, will take place the weekend of October 19-21 at the Directors Guild of America (DGA) in Los Angeles. At age 24, Singleton is the youngest individual and first ever African-American nominated for an Academy Award® for Best Director. His first feature film, Boyz N the Hood, landed him Oscar® nominations for Best Director and Original Screenplay. Other films as a writer/director/producer include: Poetic Justice, Higher Learning, Shaft and Baby Boy. He also directed Rosewood, 2 Fast 2 Furious and Four Brothers. Through his New Deal Productions, he produced the independent films Hustle & Flow, Black Snake Moan and Illegal Tender. The 2012 Film Independent Forum is presented by Indiewire, the leading news, information and networking site for independent-minded filmmakers, the industry and moviegoers alike. Additional sponsors include Premier Sponsors SAGIndie/Screen Actors Guild, Directors Guild of America, IMDbPro and Principal Sponsors Universal Studios, Montana Film Office, Korean Film Council (KOFIC), PUMit from UbicMedia, ZEFR and Co.Create from Fast Company. Icelandic Glacial Natural Spring Water is the Official Water and Renwood Winery is the Official Wine for the Film Independent Forum. New to this year, Film Independent has partnered with ZEFR, a premium content network and one of the most watched and fastest growing channels on YouTube (http://www.youtube.com/movieclips), to host a MOVIE HACKATHON during the Forum, which is sponsored by Co.Create from Fast Company. The HACKATHON is an initiative to bring the film and technology communities together to create new tools and apps for filmmakers and film lovers. Developers are invited to create original tools and apps that can be used by fans and filmmakers alike to promote movies and independent films. The final hacks will be presented to Film Independent Forum attendees at the Directors Guild of America (DGA) on Sunday, October 21 and judged by Yair Landau (partner, MK Capital), Sam Teller, (managing director, Launchpad LA), Dan Beldy (advisor, upLynk), Zach James (co-founder, ZEFR), and award winning filmmaker Ondi Timoner. Three cash prizes will be awarded to the winners ranging from $500 – $2,500. Developers interested in participating in the inaugural Movie Hackathon can sign up at http://www.zefrhackathon.com. As always, the Film Independent Forum will close with the Sloan Foundation reception where the Sloan Producers Grant award, which provides $25,000 in development funds, will be awarded to a Producing Lab Fellow developing a narrative film with a scientific, mathematical, and/or technological theme. This entry was posted on Wednesday, October 10th, 2012 at 3:38 pm	and is filed under Featured. You can follow any responses to this entry through the RSS 2.0 feed. Both comments and pings are currently closed.